The university requires another 20 million dollars, in addition to the 40 million it just received from the province, to make it's dream of the Centre of Engineering Innovation a reality. As reported in todays Windsor Star, the University still hasn't decided on a location (or locations) for this complex. It would be in the cities best interest to facilitate discussions and negotiations to secure this funding for the University, as long as the University commits to developing the bulk of the Centre downtown. The University of Windsor needs $20 million more from private and public partners to pay for its proposed $110-million engineering school and research centre. The province announced last week it would give the university $40 million toward its Centre of Engineering Innovation. The university has already raised $50 million through a bond, which leaves the project $20 million short. University president Ross Paul expressed optimism Tuesday about raising the extra $20 million. This fall, he said, U of W officials will start designing the building, pick a location or locations and attract corporate partners for financial contributions and to be tenants. "There is a lot of interest" in the engineering centre, Paul said. "We have several corporate people working with us from the biggest to some small innovative ones. Some might just make an investment of equipment or financial aid. "The potential is incredible here." Administration will report back to the board of governors within the next couple of months with more details. "We haven't asked anyone for a firm commitment," Paul said. "We've gotten letters of interest and support and now we have to deliver on that." Paul wouldn't say how many companies have said they would move into the "manufacturing courtyard" portion of the facility. It was unclear Tuesday whether the entire centre would be open by the fall of 2009. Paul said the teaching portion might be the first section to open in two years. The university has to recruit corporate partners before embarking on building courtyard wings. "We want to get it right," Paul said. "But we recognize time pressures, obviously." 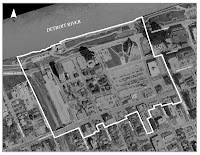 University officials said they haven't eliminated downtown as a potential location for the engineering research centre, but they will choose a space on its appropriateness for the facility. "You don't start with a location, (if it benefits everyone in the community, Ross - yes you do!) you start with what do you need," Paul said. In a meeting closed to the public Tuesday, the university's board of governors gave university management the "green light" to pursue the Centre for Engineering Innovation, said Marty Komsa, the board's chairman. He said the board of governors "asked lots of questions and gave unanimous approval" to the project. "The momentum continues," said Marty Komsa, chairman of the U of W board of governors. "The excitement continues to grow." While the board of governors had already approved and paid for architectural plans for phase one of the engineering complex, the plan has to be redesigned because the entire facility is being done at the same time. The manufacturing courtyard concept is what sold the province on funding the project, Paul said. A courtyard is a wing of the new facility dedicated to a project or a corporation where company researchers, professors and students will work together on new research ideas. In its proposal to the province, the U of W said it would be "contacting Canadian and multi-national manufacturing companies ... to solicit the initial set of module occupants and begin developing workplans for the research that will take place in them." We must get through to both the city's and the University's leadership that this is the only way to go if the ultimate goal of both administrations is the health and well-being of this community. Posted by Chris Holt at 7:38 a.m. This would be a good candiate for a brownfield redevelopment. There's certainly no lack of them in Windsor. August 29, 2007 at 8:48 a.m.
Why is everyone so quick to up-and-abandon everything we've built up so far and move further out? WE"RE RUNNING OUT OF LAND, PEOPLE! We're going to have to start reinvesting in Windsor, and this is a great place to start. But, then again, why would we want 1,500 - 2,000 students and faculty studying, working, living and playing in our downtown? All that would bring is more work, as we would have to start taking care of things down there again. Sounds like a lot of work to me. GAWD THIS CITY IS STUPID!!!! August 29, 2007 at 4:26 p.m.